It is well documented that John Shepherd-Barron did not have great expectations for the invention that was to bring him fame. He was simply looking for a way to get cash from his local bank branch at times when the premises were otherwise closed for business. The "hole-in-the-wall" was his answer. And what a brilliant answer it turned out to be. 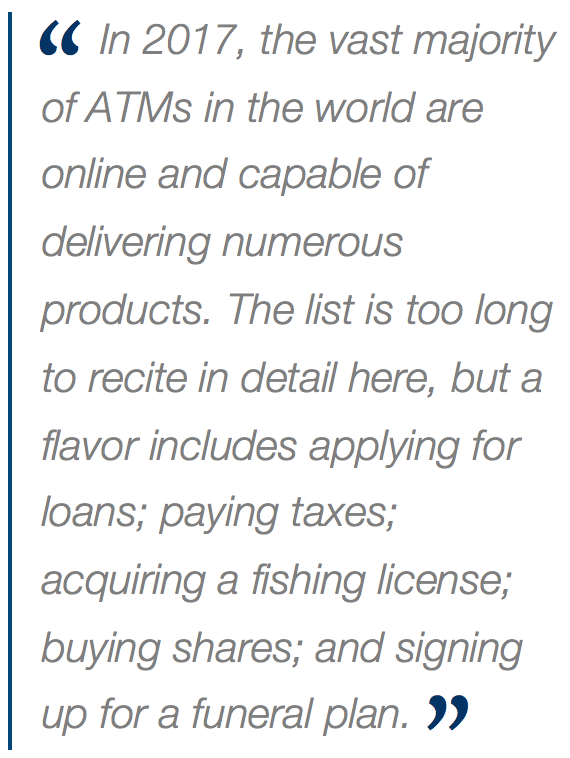 From that low-aspiration beginning in 1967, a worldwide fleet of 3 million ATMs has been spawned. 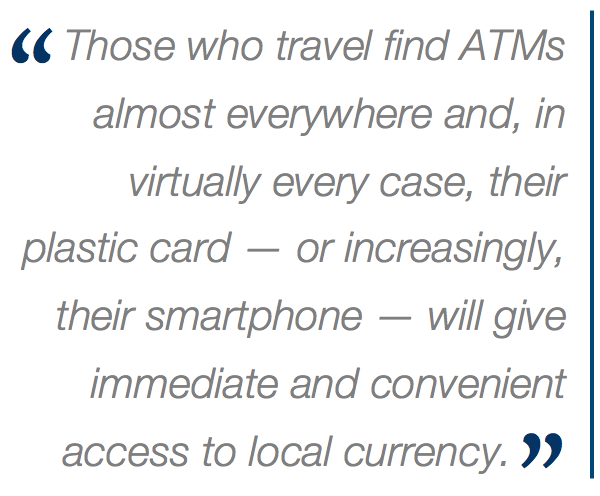 Those who travel find ATMs almost everywhere and, in virtually every case, their plastic card — or increasingly, their smartphone — will give immediate and convenient access to local currency. Of course, John Shepherd-Barron never dreamt of such ubiquity for his invention. Indeed, he felt there would be no requirement for ATMs by the late 1970s, with debit and credit cards looking set to render cash redundant. Thankfully, of course, he was wrong. In fact, the irony of John Shepherd-Barron's view of the future of payment methods is that, in all probability, his invention will eventually be viewed as the savior of cash — and even a replacement for bank branches! Back in the 1970s, many banks realized that ATMs could relieve their staff of the need to dispense cash over the counter. This, in turn, meant that bank front-of-house personnel were able to concentrate on selling profitable products to customers or, indeed, that branch staffing levels could be reduced. That was then. What a different world of financial services we live in today. Almost everywhere one looks, bank branches are closing. Most banks now claim that they cannot afford to maintain a large estate of brick and mortar on the high street or in shopping malls. Low-staff branches will soon be no-staff branches and then, perhaps, almost no branches at all. Which brings us to how ATMs have saved cash from possible extinction. Without ATMs, human bank tellers would have had to continue to dispense cash would have continued to be dispensed by human bank tellers. This, of course, would not have been cost effective in a world with fast increasing labour costs. 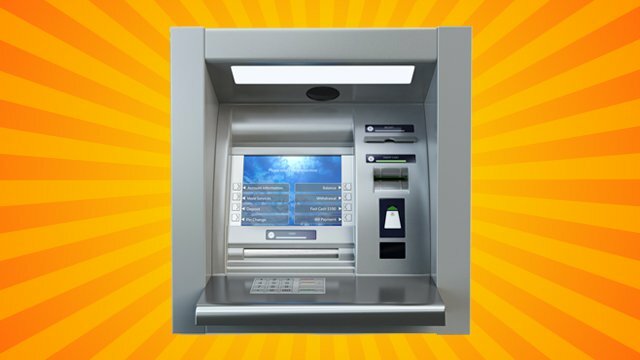 The demise of branches for economic reasons would have been significantly accelerated in a world without ATMs and, with their demise, convenient access to cash over the counter would have been severely disrupted. So ATMs have almost certainly extended the viable lives of bank branches. And, now that branches seem finally on their way to extinction, have provided a means of giving the world convenient access to cash forever. Then again, ATMs now do much more than simply dispense cash. In 2017, the vast majority of ATMs in the world are online and capable of delivering numerous products. The list is too long to recite in detail here, but a flavor includes applying for loans; paying taxes; acquiring a fishing license; buying shares; and signing up for a funeral plan. Variety, it is said, is the spice of life. If that is the case, the menu at ATMs has certainly been "spiced up" since the early days … beyond its inventor's wildest imaginings. In fact, it is difficult to think of a service currently provided at a bank branch that cannot be made available at an ATM. And so we have gone full circle. A machine devised to extend access to cash beyond bank branch opening hours is now capable of replacing the bank branch entirely. The vision for the future? There might well still be bank branches, although perhaps only for the benefit of high net worth individuals or important business clients. For everyone else — and almost everywhere — enter "smart ATMs," brought together in community financial services hubs. These hubs will not be in expensive-to-operate bank branches. Instead, they will be found in supermarkets, c-stores, petrol stations, leisure centers, cinemas, bars, local government buildings ... In short, anywhere three or four ATMs can be conveniently located together. Every significant village and urban neighborhood should be able to sustain a financial services hub. Cash services will feature prominently, with smart ATMs allowing individuals and businesses to deposit and withdraw both notes and coins. The "smart" aspect in this case is that deposited cash will be efficiently recycled, not simply stored for collection. This will reduce cash-outs, limit the need for cash deliveries and, of course, minimize the carbon footprint of the ATMs. However, cash will not be the be all and end all of community financial services hubs. These hubs offer public access to a far wider range of products than ever on offer at the average bank branch. Many citizens still want a convenient local touch point to fulfil their financial services requirements. Community hubs will provide that touch point, meeting the needs of neighborhood residents and businesses, while stimulating vibrant economic and social activity. No one in 1967, not even John Shepherd-Barron, could have foreseen a time when ATMs would serve not only as a primary source of cash, but also as a replacement for bank branches themselves.